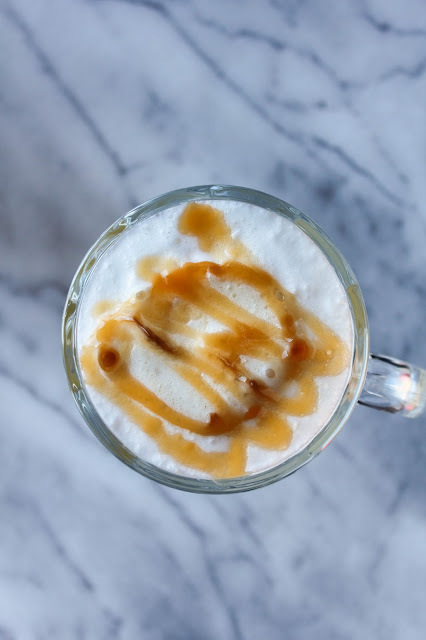 Surprise your family and friends by making your own creamy Caramel Macchiato at home! It goes superbly with one or two homemade Double Chocolate Biscotti. The perfect holiday pairing! Each year for as long back as I can remember, my mom and I have had a holiday cookie baking day. We each gather our favorite recipes, some new, some old, and spend an entire day in the kitchen together. When my boys were younger this included them as well, rolling out and decorating their beloved sugar cookies. Now that they've gotten older they don't help as much, but I still get them in the kitchen a little by bribing them with treats. Don't judge, it works! I love making something special for my mom and I to drink and snack on as we bake away. Some years it was hot chocolate and doughnuts, others it was coffee and a homemade coffee cake, but this year I created something new. 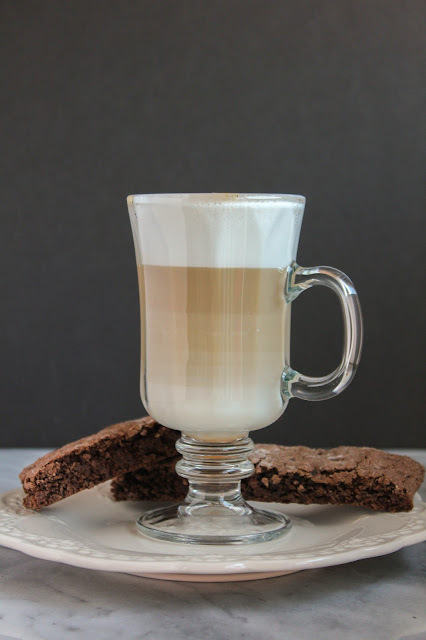 I made us Caramel Macchiatos with Double Chocolate Biscotti! 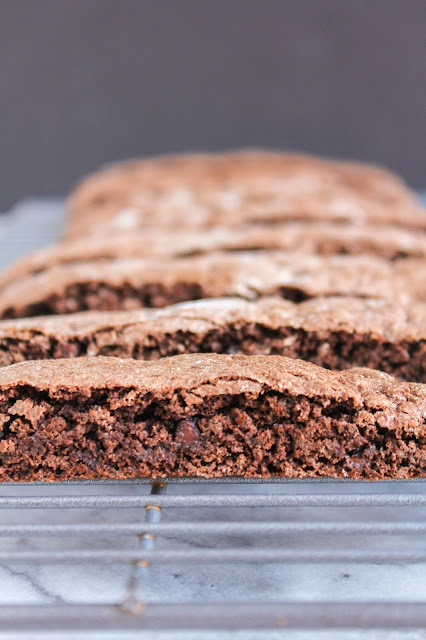 The biscotti are chocolaty, crunchy, and perfect for dunking in the creamy, caramely Macchiato. YUM! Starbucks has a fabulous line of seasonal coffees and cocoas that I just can't get enough of! The line comes in both ground coffee and K-cups, which is perfect for me since I have a Keurig. 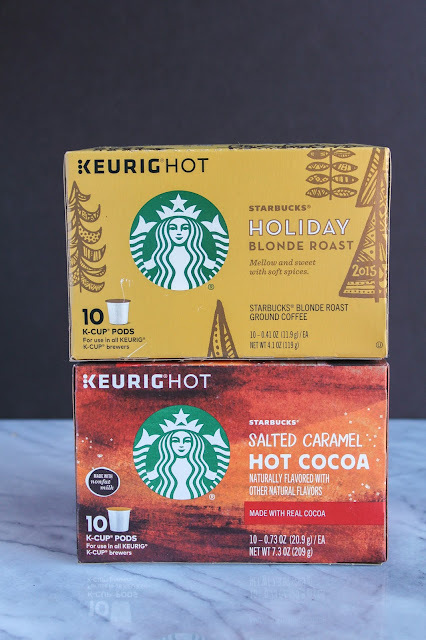 The Holiday Blonde Roast is definitely a favorite, and my whole family adores the Salted Caramel Hot Cocoa. And, right now you can get a $5 Starbucks Card e-gift when you purchase 3 or more qualifying Starbucks products! 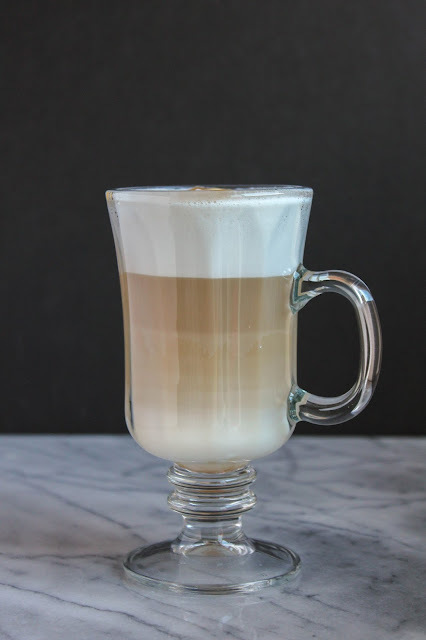 Since the Caramel Macchiato is one of my favorite drinks at Starbucks, I loved making my own version at home. Made with caramel syrup, steamed milk and the Holiday Blonde Roast coffee, it's rich, frothy, and downright delicious! Do you have a favorite coffee drink or delicious treat to pair with your coffee? Share with me! You can find some fabulous recipes on the Starbucks website, too! 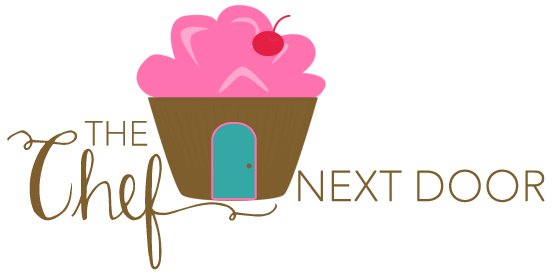 Now, let's get in the kitchen! Warm the caramel syrup and milk in a small pot on the stove. When warm and steaming, froth the mixture until it gets foamy. Pour the milk mixture into a mug, then slowly pour in the coffee. Drizzle the caramel sauce on top and serve. Preheat the oven to 350 degrees. Line a large baking sheet with a silicone baking mat or parchment paper. In a medium bowl, whisk together the flour, sugar, cocoa, chocolate chips, baking powder, baking soda and salt. In a large bowl, combine the vanilla and eggs. Add the dry ingredients to the wet and stir until well blended. Divide the dough in half and turn it onto the prepared baking sheet. With lightly floured hands, shape each dough half into a long roll, about 12 inches, and pat it into 1/2-inch thickness. Bake for 20 minutes, then remove from the oven and cool on a wire rack for 10 minutes. Cut each roll diagonally into slices. Place the slices on the baking sheet, cut side up, and bake for an additional 15 minutes or until almost firm. (The biscotti will harden as they cool) Remove the biscotti from the baking sheet and allow to cool completely on wire rack. 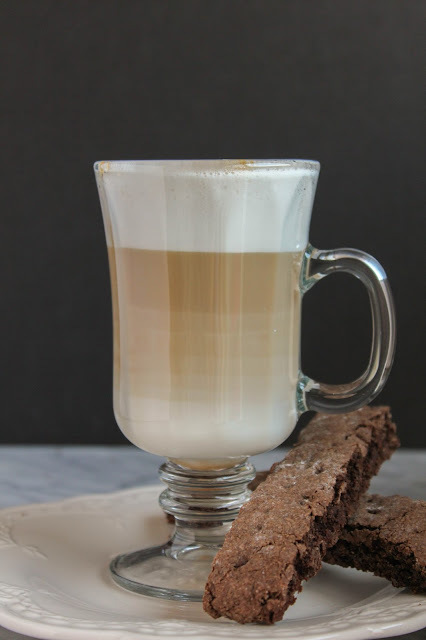 Serve your Macchiato with one or two of the Biscotti for dunking! You can find the entire Starbucks Seasonal line of coffees and cocoas at Meijer. Mine was located in a large display in the center aisle of the store.